When it comes to comic book movies, all the attention is usually focused on the cape-and-cowl crowd. However, there are plenty of films based on non-superhero comics, and we’ve selected a few of our favorites. In Robert Rodriguez’s neo-noir anthology film, each chapter is just as entertaining as the last. The hyper-stylized aesthetic perfectly complements the brutal and gritty storylines featuring the unsavory inhabitants of Basin City. With a screenplay that expertly called back to the classic Hollywood noir style of yesteryear, “Sin City” stands as not only one of the best non-superhero comic book movies, but as one of the best comic adaptations period. The second film on this list is perhaps not coincidentally also an adaptation of a Frank Miller series. Director Zack Snyder was in his peak form with this film, crafting a visceral and violent thrill ride that more than made up for any historical inaccuracy. Of course, the film would be nothing without Gerard Butler in the star-making role of King Leonidas of Sparta and the endlessly quotable lines he roared throughout the film. Another visually striking adaptation, Edgar Wright’s tribute to classic video games and indie music is arguably his best film. “Scott Pilgrim” features a slew of standout performances, with even the most minor appearances being memorable. With script filled to the brim with wit and humor and breakneck pacing, “Scott Pilgrim” is irresistibly endearing. Any film penned by the Wachowski siblings is worth taking note of, and “V for Vendetta” represents their finest post-“Matrix” work. Rejoining the Wachowskis as V is quintessential villainous actor Hugo Weaving, here portraying a much more morally gray character than his usual stark antagonist. 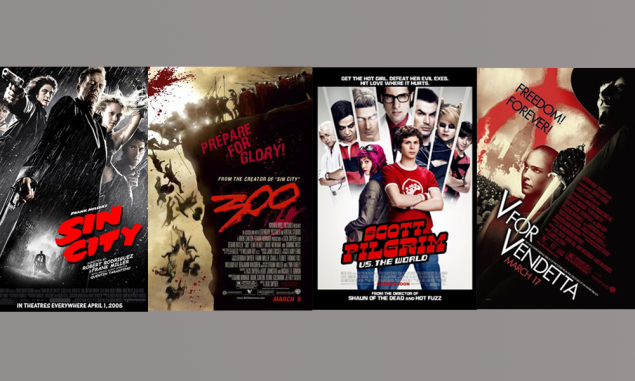 Which of these films is your favorite? YOU can vote now below to decide!